This is a Newport 561D-XYZ ULTRAlign Precision Multi-Axis Linear Positioner with Crossed Roller Bearings and an integrated Newport 561-Tilt Fiber-Optic Tilt and Rotation Stage. Made of Stainless Steel for thermal stability, and having Crossed-Roller bearings running in precision-ground ways for very accurate movement, this stage is one of Newport's best! The Newport SM-13 actuators shown are included in the price. 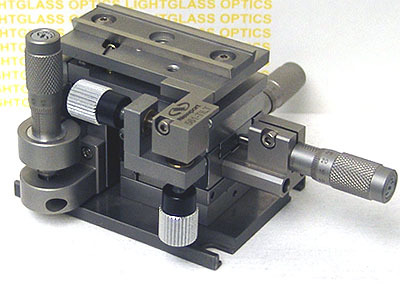 Please contact us if you need differential micrometers, which can be substituted for the difference in price.